- SAS Controller: LSI SAS2008. - Eight SAS/SATA ports (four external, four internal). - Up to 6 Gbps per port data transfer rate. - Four internal SATA x1 connectors. - One external SAS x4 connector (SFF-8088). 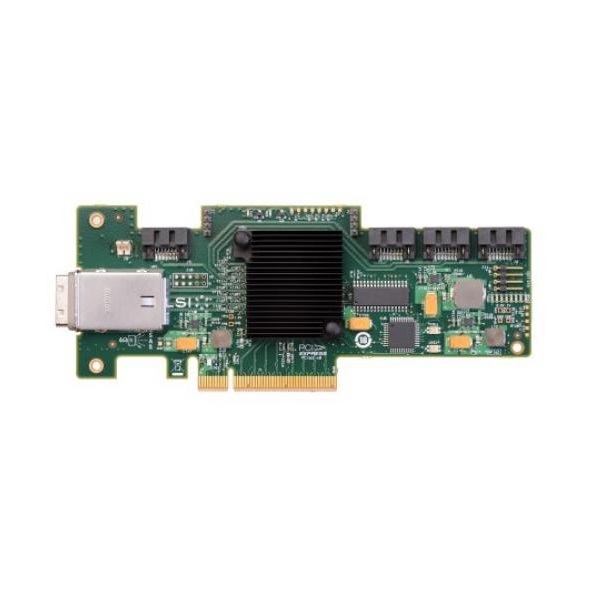 - PCI Express x8 2.0 host interface. - MD2 small form factor. - High performance I/O Processor: PowerPC 440 @ 533 MHz. - RAID levels : None (uses RAID as provided by external disk enclosures). - Maximum endpoint devices: 512. - Power consumption: 13.5 W.
- Connection to supported internal and external tape drives. - Connection to supported external storage controllers. - Support for SSP, SMP, STP and SATA protocols - flexible to optimize costs. - Environmentally friendly due to low power consumption. - LSI Fusion-MPT architecture drives more than 290,000 I/Os per second. - End-to-End CRC with Advanced Error Reporting. - T-10 Protection Model for early detection of and recovery from data corruption. - Spread Spectrum Clocking for EMI reductions. - IBM Half High LTO Gen 3 SAS Tape Drive (43W8478). - IBM Half High LTO Gen 4 SAS Tape Drive (44E8895). - IBM Half-High LTO Generation 5 SAS Tape Drive (49Y9898). - IBM DDS Gen 5 SATA Tape Drive (43W8480). - IBM GoVault Internal Dock (42D8771). Internal tape drives are connected to the IBM 6 Gb SAS HBA using the internal SAS or SATA cable supplied with the tape drive. - IBM System Storage DS3512 Express Single Controller Storage System (1746A2S). - IBM System Storage DS3512 Express Dual Controller Storage System (1746A2D). - IBM System Storage DS3524 Express Single Controller Storage System (1746A4S). - IBM System Storage DS3524 Express Dual Controller Storage System (1746A4D). - IBM 3 m SAS Cable (39R6531). - IBM 1 m SAS Cable (39R6529). Clique no botão abaixo para adicioná-lo Placa Adaptadora HBA IBM 6Gb SAS (46M0907) para sua Lista de Favoritos.